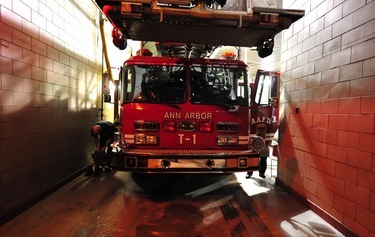 Proposals by Ann Arbor leaders to cut deep into police and fire services to balance the 2010-11 budget are drawing heavy criticisms this week from the firefighters union and a group of candidates running for City Council. Late Tuesday night, four candidates seeking to oust members of the current Ann Arbor City Council majority released a joint statement opposing the cuts. The four candidates — all Democrats — are Patricia Lesko, who is running for mayor, 1st Ward candidate Sumi Kailasapathy, 4th Ward candidate Jack Eaton and 5th Ward candidate Lou Glorie. They called the potential cuts in City Administrator Roger Fraser's proposed 2010-11 budget "unnecessary" and a "disservice to taxpayers." Also on Tuesday, Matt Schroeder, president of the firefighters union, released an open letter to the City Council, arguing Ann Arbor deserves better fire protection. "As Local 693 has continued to find ways to have input into Mr. Fraser's quest for a regionalized fire service for Washtenaw County, we remain disappointed by the lack of interest by the city administrator for our input into the process," Schroeder wrote. "With proposed cuts to our department being double of other city departments and our ability to provide services proposed to reduce our ability by 22 percent, I challenge you to reconsider cutting the fire department. We were leaders in our attempt to help the city overcome its financial struggles by taking a 3 percent cut and contributing more to our pension. We have been committed to the safety of our citizens to include the students of our university. We are truly lean and fiscally responsible." Schroeder urged council members to ask questions of the administrator, the fire chief and the union. He said he's been directly impacted on a personal level by the most recent fire fatality in the city and knows from a professional perspective what it could have been if the fire department had already been cut by then. "This is an emergency, please do not allow this core service to be politicized," Schroeder wrote. "The citizens deserve your leadership on this issue. Their safety is at stake." Schroeder directed council members to read a recent Detroit Free Press article that reported frustration is growing over how some communities in Southeast Michigan are responding to their mutual aid agreements for fire protection, and fire aid pacts aren't holding up. Fraser and his staff have worked in the last several months to close an additional $5.2 million gap in the city's budget. Those cuts impact public safety more than any other area. Unless the City Council rejects Fraser's plan, 20 positions in the fire department and 20 in the police department will be eliminated in July. The four challengers running for council argue in their joint statement that the cuts will take the number of sworn officers down from 99 to 87, which they say is too deep a cut when Ann Arbor already has as few as six police officers on patrol at any given time. “Cutting emergency services has become business as usual when closing these alleged budget gaps," Lesko said. "In all the budgets the administrator has presented to council since 2003, he has inaccurately projected deficits. In 2009, Mr. Fraser’s general fund budget projections were off by over $2 million dollars. Ann Arbor’s general fund ended up with $2 million dollars more than his budget projected it would. Eaton, a labor lawyer with experience negotiating union contracts, said he questions the motivations behind the proposed cuts. Lesko, Kailasapathy, Eaton and Glorie pledged that should Fraser's proposed 2010-11 police and fire budget cuts be enacted, if elected, they will co-sponsor a resolution to re-open the that budget and direct the administrator to reverse the cuts. Glorie said fire and safety services are indispensable. She also thinks proposed water and sewer rate increases can be avoided. "I suggest the city release the surpluses in the IT, solid waste and fleet funds immediately to pay for essential services and prevent an escalation of water and sewer rates into the exosphere," she said. "And while we’re at it, let’s stop the borrowing. Our city’s CFO brags about the city’s AA+ credit rating from Standard and Poor’s. Since the bond rating industry gave top grades to subprime derivatives, this does not reassure." Kailasapathy, a certified public accountant, said she has analyzed the city's budget and thinks there's enough money to maintain police and fire services at current levels. Lesko, Kailasapathy, Eaton and Glorie have announced they will be hosting a meet and greet event at Vinology on Main Street in downtown Ann Arbor from 5-7 p.m. Sunday. Ryan J. Stanton covers government for AnnArbor.com. Reach him at ryanstanton@annarbor.com or 734-623-2529 .